The Chancellor of Football covers NFL football like no one else. The history of the game and how it relates to today's game all under one roof! 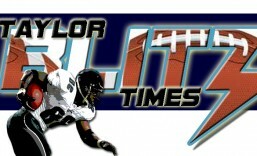 Honor the heroes of the game, preserve its history, promote its values & celebrate excellence everywhere. When it comes to the strongest single season NFL champions, they rarely come from dynasties that rule a decade. Most are borne from the ashes of a playoff loss the previous season. Whether the team hadn’t quite peaked despite being in the playoffs, or an effort that comes up short against the eventual champion provides the motivation fueling the season to come. 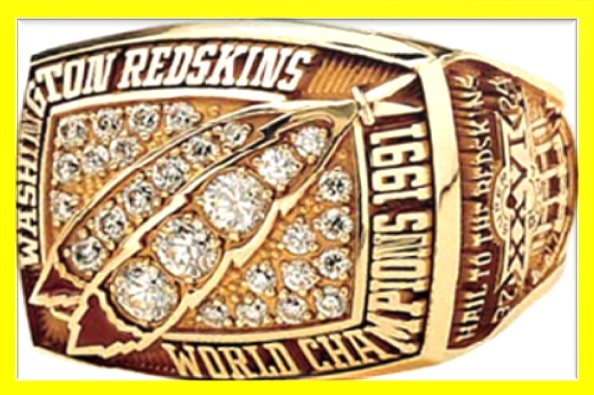 Washington Redskins best team…1991 Super Bowl XXVI champions 37-24 over MY Buffalo Bills!! Congratulations Wilber Marshall, Darryl Green, and Earnest Byner formerly of the Cleveland Browns. It was good to see him get a ring. This team had no weaknesses. Mark Rypien also had RB Gerald Riggs and a prolific receiving corps in Gary Clark (70 rec / 1,340 TDs /10 TDs) Ricky Sanders (45 rec / 580 yds / 5 TDs) and Hall of Famer Art Monk (71 rec / 1,049 yds / 8TDs). Byner was a 1,000 yard rusher while Riggs was the battering ram at the goal line, evidenced by his 11 touchdowns with just 248 yards rushing. Washington finished 4th offensively and 3rd in defense despite yardage gained in garbage time in 9 blowouts. This might have been Coach Joe Gibbs’ masterpiece. 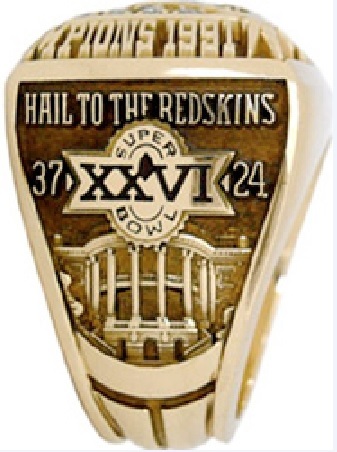 After winning Super Bowl XXII, the Redskins slipped down to a team that was just under the league’s elite. Gone was Super Bowl MVP Doug Williams, Timmy Smith and the aging vets that carried the team through the late 80’s. With the signing of LB Wilber Marshall in ’88, they pulled a coup as he became the first free agent to switch teams in a decade. They retooled with middle round draft picks and trades as they stayed competitive 1988-1990. In ’91 Marshall had arguably the best season for a non Pro Bowl player with 135 tackles, 5.5 sacks, 5 interceptions and 4 forced fumbles. It was Marshall who also changed the way players were voted to the Pro Bowl. Pundits and writers argued players couldn’t leave their animosities before entering the voting booth. A few years later the fan vote was included. They were close in 1990 but weren’t quite ready for primetime. They upset the Eagles in the wildcard (Buddy Ryan’s last game) 20-3 then tried to upend the 49ers in the divisional round but Rypien was intercepted twice in the endzone to thwart drives and lose 21-10. Rypien was a steady veteran QB but could he win in the postseason?? However the 2 best NFC teams in 1990 were the New York Giants and the San Francisco 49ers, who was trying to three-peat. However both had peaked and would need to retool. The Redskins along with the experts thought 1991 was going to be different. In starting out 11-0, the ‘Skins outscored opponents 361-139 which included 3 shutouts. This team was stronger than any of Gibb’s other Redskin teams. The 83 squad scored on everyone but everyone was scoring on them too…as evidenced by losing a game 48-47 to Green Bay and losing to Dallas 31-30 in the opener and allowing 38 in the Super Bowl loss to the Raiders. The 82 team was more smash mouth and the ’87 squad was good but benefitted from the strongest 49er team in history being upset in the playoffs that cleared the path. This team finished 14-2 as Gibbs utilized the full roster through situational substitutions. Every player had a designated role and they hit the playoffs running. Knocking off Atlanta 24-7 before clobbering the Detroit Lions 41-10 in the NFC Championship Game. In Super Bowl XXVI they overpowered Buffalo 37-24 in a game that wasn’t that close. They led at halftime 17-0 and after 3 plays of the 3rd quarter were up 24-0 before Buffalo scored. Joe Gibbs’ charges only had 1 more playoff season the following year before the team slid into obscurity. The team became a step too slow with many of their players aging. The Redskins wouldn’t make the playoffs in the next 7 years. By then Gibbs Hall of Fame career would be over as well as this championship era in Washington. Yet 1991 saw one of the strongest champions in league history. Thanks for reading and please share the article.